For years my cousins and I had heard that our Grampa Metz had been wounded in World War II. We were young and loved to play Army so we were quite interested in what happened to him during the war. However, he never wanted to discuss his combat experiences.. until one day. My older brother and I along with two of our cousins were visiting Grampa Metz for a family reunion. All four of us boys pressed him to tell us how he was wounded in the war. Finally he opened up to us. Sitting at the kitchen table one of the cousins massaged his shoulders to keep him relaxed as he spoke. He said that he was an infantryman during the invasion of Normandy. They had penetrated past the beach and were moving inland when riding in a jeep they were surrounded my Germans. I’m thinking this incident happened a few days after the initial invasion. Anyway, he said that even though they were surrounded by Germans, the Germans were surrounded by American forces. “They knew if they killed us that they would be killed.” said Grampa. However, a stray bullet hit Grampa in he right arm. Luckily, it didn’t strike any vital organs. Grampa then pulled up his sleeve and showed us boys the scar and we all checked it out in awe. Later the Germans surrendered to the outnumbering U.S forces and Grampa went on recover from his wound and returned to combat. 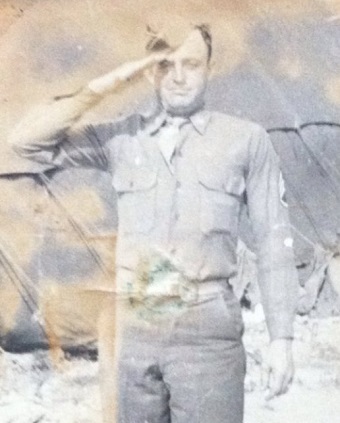 Grampa Metz earned the Purple Heart and retired as a Master Sergeant from the Army. He passed away in 2003. Even though I’m sure there are some things that Grampa chose not to share with us kids, I’ll never forget listening to him share his story of service. EDIT/ADDITION (February 2019): I spoke with my brother and double-first cousin who are both older than I. They say what really happened was that Grampa Metz was involved in a fire fight with German soldiers. His unit was flanked and he was captured. The capturing German soldiers looked at his ID tags and saw “Metz”, a German name, so they released him. He was wounded in the arm in that firefight. Wow.